Chakras, sometimes translated as 'cakras' or 'channel-wheels', are energy centers associated with particular parts of the body, and considered an interface between the physical and non-physical levels of human and subtle anatomy. Many different cultures and spiritual or energy-healing traditions have developed some type of chakra mapping, including Native American, South American, Islamic Sufi, Hindu yogic and Buddhist meditative traditions. The chakra mappings that are most commonly taught in the West are usually of Hindu origin, deriving from a branch of yoga called 'kundalini' yoga. However, many lineages of Tibetan Buddhism also utilize chakra mappings, often referred to as 'channel-wheels' in translations of Tibetan texts. While these mappings share many traits with kundalini yoga chakra systems, and probably have common historical roots, there are also several key differences between the two types of systems. One difference is in the number of chakras. The dominant Hindu-based kundalini yoga chakra mapping contains 7 main chakras, located at (1) the base of the spine (root), (2) lower pelvis, (3) solar plexus, (4) center of chest (heart), (5) throat, (6) forehead (third eye), and (7) crown of the head. Various schools of Tibetan Buddhism posit anywhere from 4 to 10 main chakras. The diagram to the left shows one 10-chakra system, corresponding to a system described by Geshe Kelsang Gyatso, of the Gelug school of Tibetan Buddhism , in his book Clear Light of Bliss: The Practice of Mahamudra in Vajrayana Buddhism. The major 7 chakras are each shown in 'lotus' form, with varying colors and number of petals on each one, while the minor chakras in this system are simply shown as black dots. Vajrayana Buddhism is the main form of Buddhism in which chakras techniques are utilized. Tibetan Buddhist systems that posit 9 or less chakras are all subsets of this 10-chakra system in some way, with varying emphasis on the importance of different ones. 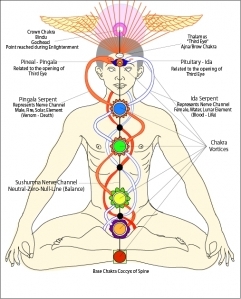 In terms of location, another key difference between Hindu yogic and Tibetan Buddhist chakra mappings is that in those systems with 7 chakras, the 3rd chakra in the former is usually presented as in the solar plexus, while in the Tibetan systems it is very often located lower, just below the navel. In all chakra systems, the chakras are said to be connected through 'nadis' or energy channels, and these two also differ between systems. Also, different colors, elements, symbols, and mantras (chants/sounds) are associated with each chakra. These colors, symbols, and mantras are the main ways to work with the chakras meditatively in the Tibetan Buddhist traditions. Through different visualization techniques utilizing these tools, the 'winds' or subtle energies that move between these chakras are triggered and directed. Through these shifts different meditative doorways are opened to states or planes, or 'lokas', connected to enlightenment. Another key difference between Hindu kundalini yoga traditions and Tibetan Buddhist meditative traditions is that in the former, the emphasis is on moving the kundalini or life force energy up from the root chakra into the crown. 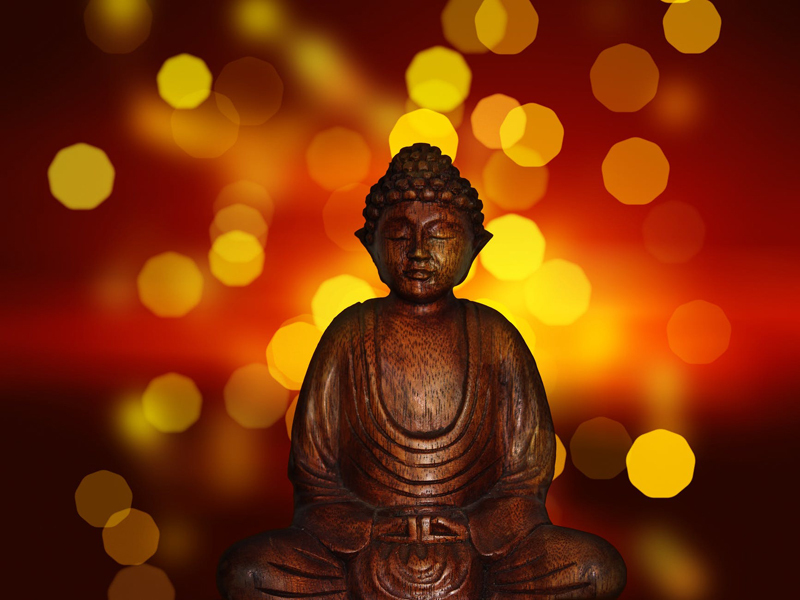 While this is also emphasized in certain Tibetan Buddhist traditions, there are also many other techniques that emphasize moving the energy down from the crown to the heart, or centered on moving the awareness through one particular chakra into the associated loka. Note that this article is also included in my e-book Introduction to Buddhism and Buddhist Meditation.